Staff of the Soho Works in 1860. 1909. 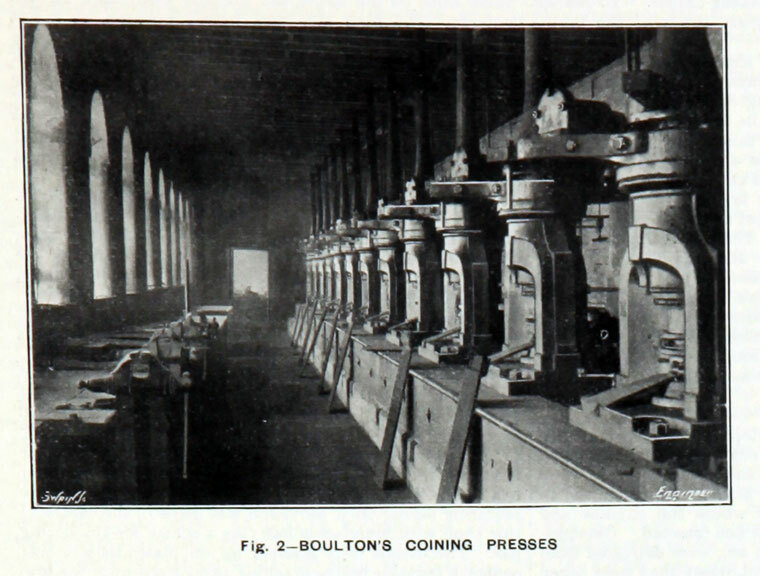 Boultons' coining presses from the works. 1909. 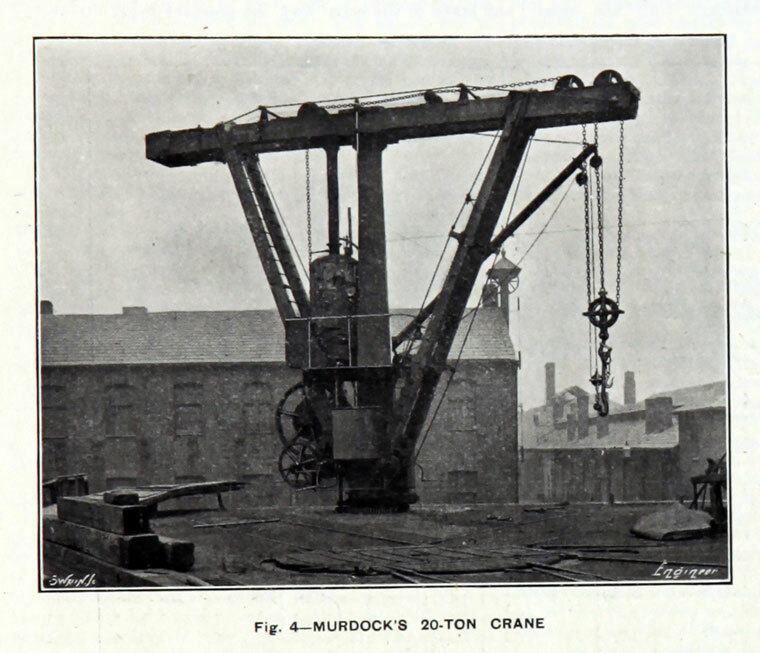 Murdocks' 20 ton crane. An historical relic from the Soho Works. 1909. Lathe with worm drive. 1909. 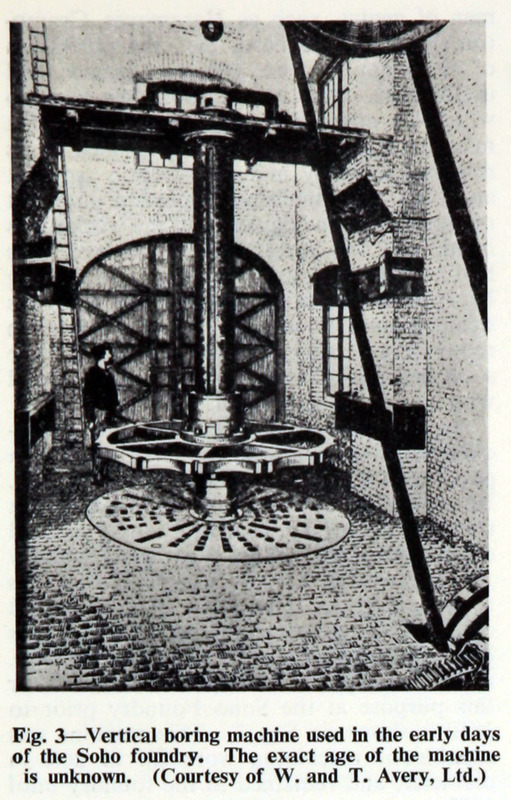 Watt tilt steam hammer. 1795 Matthew Boulton began construction of the Soho Foundry for Boulton and Watt about one mile from his Soho Manufactory; in the Foundry steam engines to the design of James Watt would be built for the new use, namely in mills and factories which required rotating shaft drive (unlike the mine pumps, which is what Boulton and Watt had made to date). The foundry was located at Smethwick, near Birmingham, (grid reference SP037885). The foundry opened in 1796. 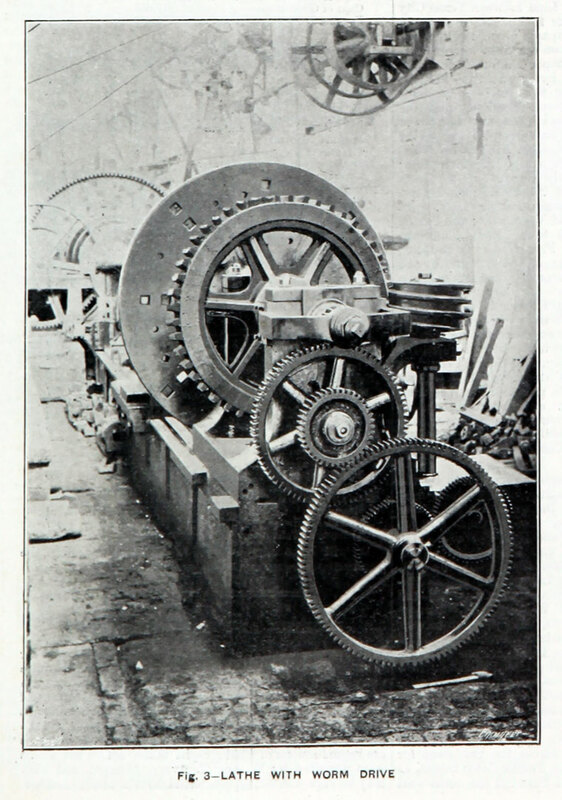 The workshops were managed by William Brunton, who constructed a machine for cutting and shaping the teeth of wheels. Mid 1830s James Watt (Junior) took the French Walls Works into his own hands and ran it in conjunction with the Soho Foundry, though as a separate concern, until old age forced him to give it up in 1842 . 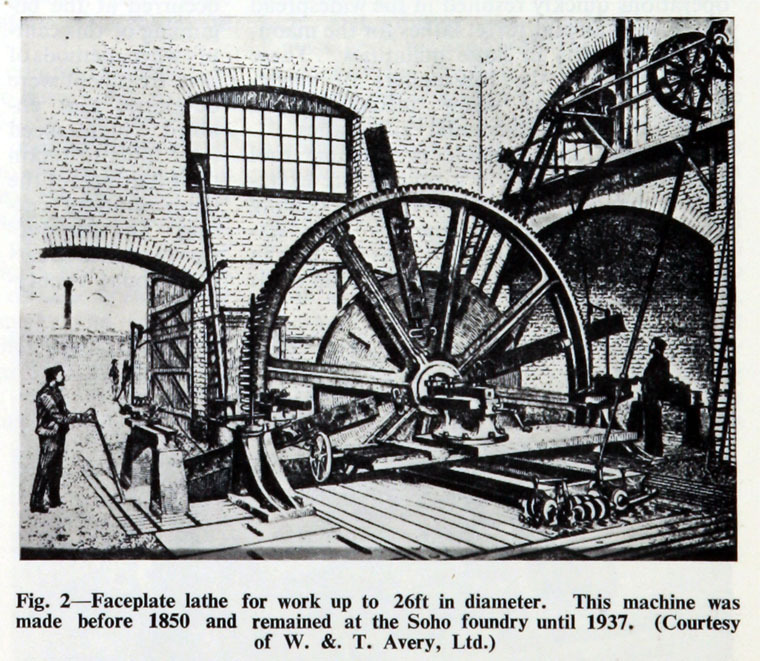 The French Walls works provided the Soho Foundry with boiler plates and uses (semi-finished forgings for engines) as well as turning out merchant iron and steel. Scrap from the Foundry was returned to the French Wall's for reworking . 1849 After James Watt (Junior)'s death, The Soho was let to various persons. The name of Boulton and Watt's company was changed to James Watt and Co.
1850 William Buckle was appointed to the Royal Mint. William Henry Darlington became the General Manager of James Watt and Co (successors to Boulton and Watt), and was there in the last days of the company, helped by his sons Seymour Nance Darlington and Courtney Darlington. He was responsible for saving many historically important documents and artefacts from the works, helped by George Tangye and Samuel Timmins.See 1910 article in the American Machinist here. 1909 A former employee, Charles H. Wall provided some interesting reminiscences in The Engineer in 1909 , although he tended to omit the forenames of key personnel. We learn for a period from the late 1850s to 1873 or 1874 a Mr. Brown was the Managing Director. When Buckle left (to become Bullion Manager at the Royal Mint) his successor as Works Manager was Mr. Carmichael, who came to Soho from Portsmouth Dockyard. He left in 1863, to go to Banbury as a partner in Barrows and Carmichael. He was succeeded by his former assistant David Anderson, who had gone to Soho c.1854 from Portsmouth Dockyard and remained in post until he retired in 1883. Another of Carmichael's assistants was Mr. Forbes, who became chief of the outdoor staff. Mr Garland was Chief Draughtsman, with Mr Jolly as his assistant. Frank Shaw was the foundry foreman. Mr Lewis foreman patternmaker, Walton foreman coppersmith, Mollineux foreman blacksmith. 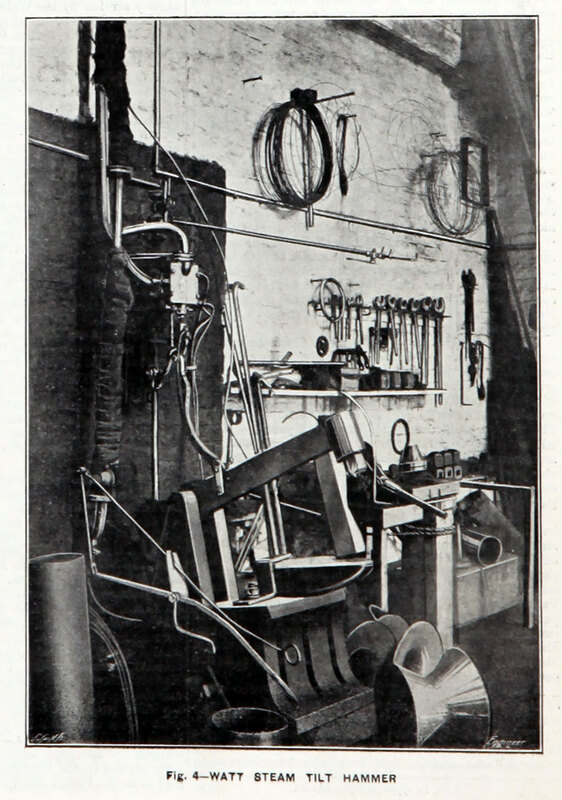 Charles H. Wall shed some light on the history of some of the equipment which intrigued The Engineer's reporter in 1895. He described a pipe flange facing machine which was effectively a milling machine, having a facing cutter with inserted tools. 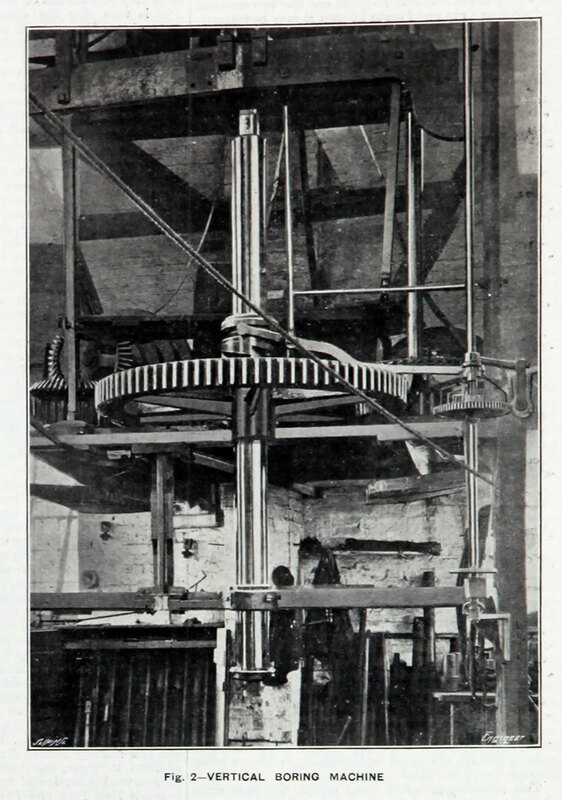 The horizontal spindle was driven by a worm and wheel. The pipe was clamped to a table, and the machine's headstock traversed on abedplate. 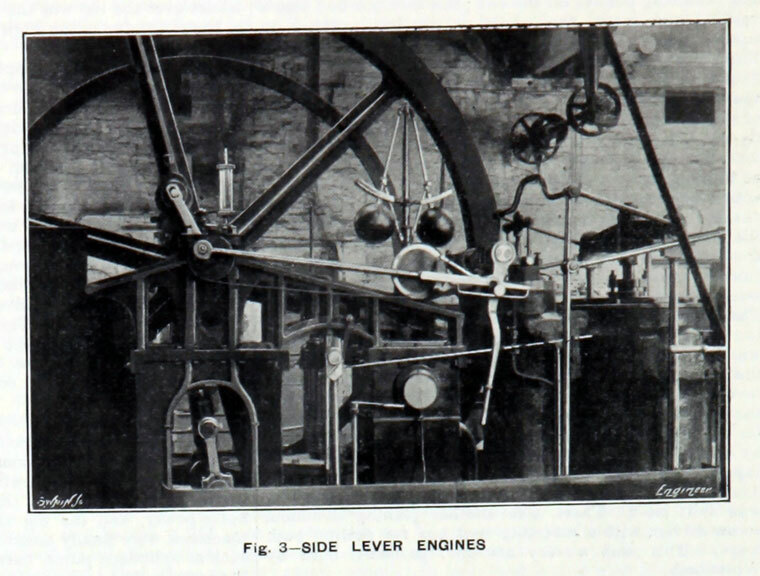 The machine was designed in the 1850s by Carmichael and his assistant Harper, and it became known as 'The devil'. A machine designed c.1850 used magnets to remove separate ferrous and non-ferrous matwerial in swarf. A wall planing machine was described at some length. It was designed by Carmichael and Harper in the early 1850s. It had a stroke of 15 ft. A similar machine with a stroke of 25 ft was built later. The factory is mostly extant, and is now the home of Avery Weigh-Tronix (formerly Avery Berkel), who make weighing scales. The site includes William Murdoch's cottage and overlooks Black Patch Park. There was a small museum there, open only by appointment. The grade II listed Pooley gates, of cast iron, are marked with "a Liver bird above ropework draped with cloth, flanked by nautical symbols including oars, flags and bugles, ships' wheels and intersecting dolphins". A plaque reads: "These gates were cast by Henry Pooley and Son about 1840 for the Sailors' Home, Liverpool. The Avery and Pooley Foundries were amalgamated in 1931". The building is a Grade II* listed building. The gates and adjacent canal bridge are Grade II listed. Two large machine tools from the works were saved for preservation. 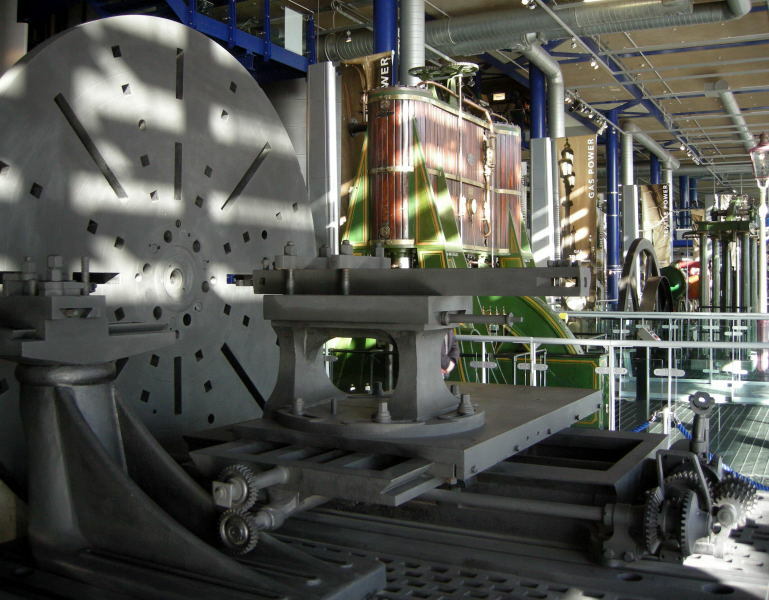 The large c.1850 wheel lathe is on display at the Thinktank museum in Birmingham, and a large wall planing machine lies dismantled amongst other historic treasures in the Birmingham Museums reserve collection. 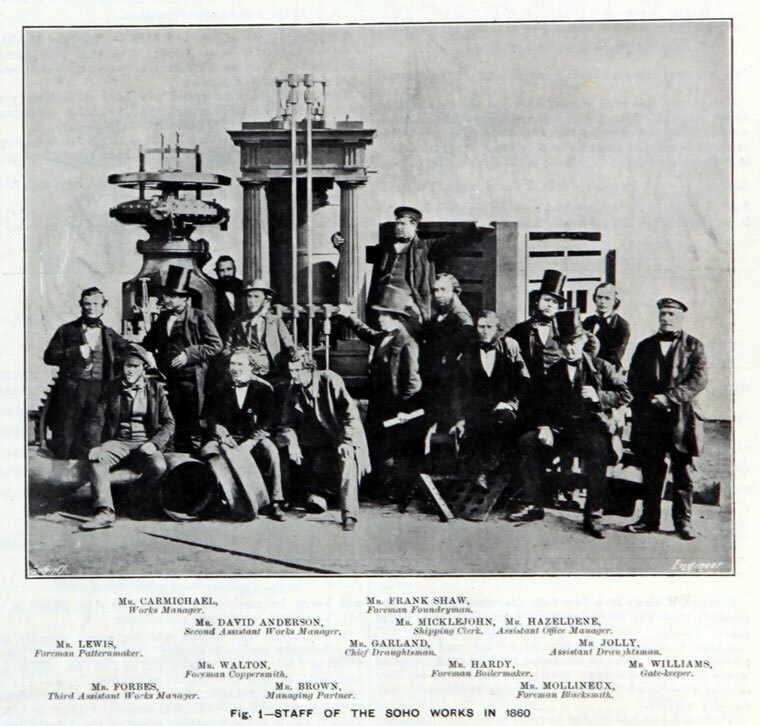 The Engineer published a series of articles on The Soho Foundry in 1895. 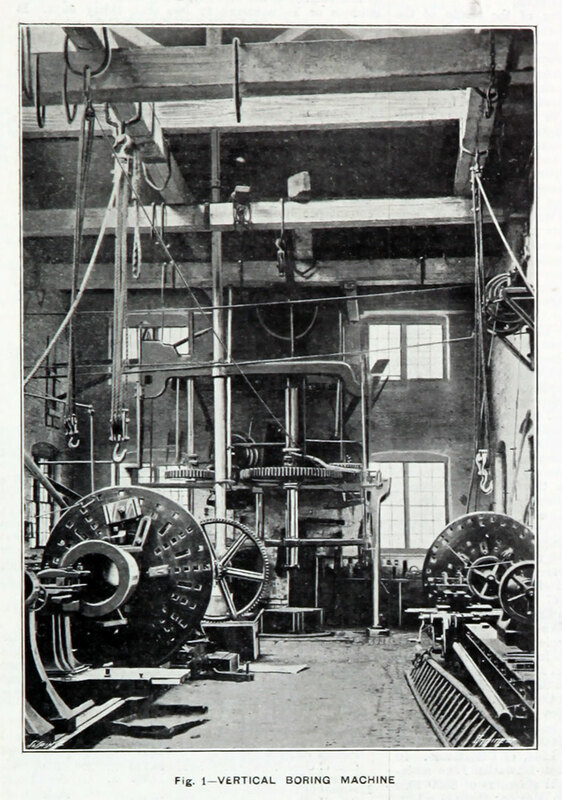 Further recollections of Soho Foundry were published in The Engineer 1909/09/10 (photos reproduced here) and in The Engineer 1909/12/17. The latter includes interesting accounts of early manufacturing and measuring methods practised at the works. This page was last edited on 14 February 2019, at 13:50.